The Tait trains, also known as the "Red Rattlers", operated on the Victorian Railways suburban network being introduced in 1910 until 1984 when the last units were scrapped. They had a partly open saloon layout, with bench seats running across the train, the saloon being divided by partitions into a number of smaller areas. Each seating aisle was provided with its own exterior sliding door. 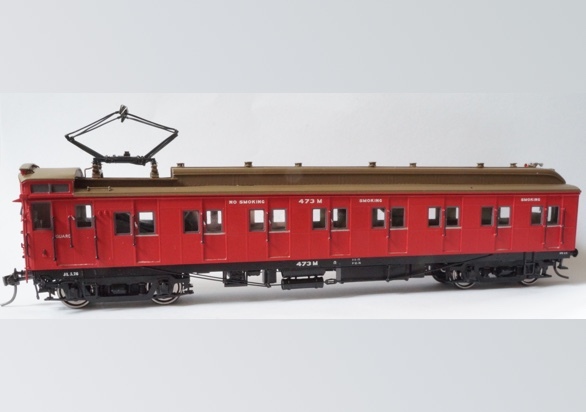 The exterior of the trains were of two main styles: the original cars had a clerestory roof, and those built from the late 1920s onward had a simpler arched roof. From 1971 the interior was simplified to cut maintenance costs, with some doorway windows being replaced by metal and plywood, and the wooden latticed sun blinds being removed. They are fully ready to run with interior lighting and operating headlight and marker lights were applicable.